The Windows 10 Creators Update is still a day away from roll-out, but Surface Dial owners are getting something a little special today. 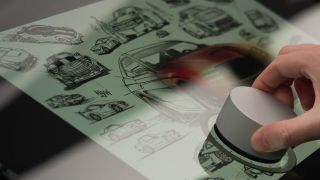 Microsoft has announced Surface Dial support has been added to a slew of new programs: CorelDRAW, Autodesk’s SketchBook, Silicon Bender’s Sketchable, and Algoriddim’s djay Pro. The Surface Dial integration allows users to add a new twist into their creative process. For example, in djay Pro, you can take advantage of Microsoft’s radial control module to scratch, scrub, loop and add filters just as if you were spinning a physical record or knob. Meanwhile, SketchBook and Sketchable are both drawing and sketching-focused apps in which the Surface Dial now comes in handy for changing colors, brush styles and sizes, tools and zooming on the fly. You might have noticed Adobe’s creative suite was absent in the handful of supported programs. For now, Adobe has only treated us to a technology demonstration of Surface Dial working with Premiere Pro CC, the company’s video-editing software. At the National Association of Broadcasters show in Las Vegas, the software maker demonstrated using the Surface Dial for scrubbing through footage. This includes accelerated shuttling through clips and sequences. Alternatively, you could use the Dial for immediate stop and start of playback, as well as incremental speed increase, decrease and reverse up to 32x playback. This latest collection of Surface Dial-supported apps builds upon a growing family of apps that includes Mental Canvas, StaffPad, BlueBeam, Siemens NX, DrawBoard, and Spotify. During our time with the Surface Studio, the Surface Dial was one of the more underwhelming aspects of the experience, due to its limited support. With every new app and more to come, Microsoft may make this peripheral as useful as the Surface Pen.